Hot-weather running is almost here, or in the case of those in United States’s desert Southwest and the humid Southeast, it’s here with a force, which makes it prime time to post a bit about my experiences using the UltrAspire Alpha 3.0 Hydration Vest ($112.95 to $124.95, depending on color) for miles and miles of trail runs lately. The UltrAspire Alpha 3.0 Hydration Vest is a 5.75-liter (350-cubic-inch) vest that weighs in at 12.2 ounces/345 grams, including the two 550-milliliter structured UltraFlask bottles. 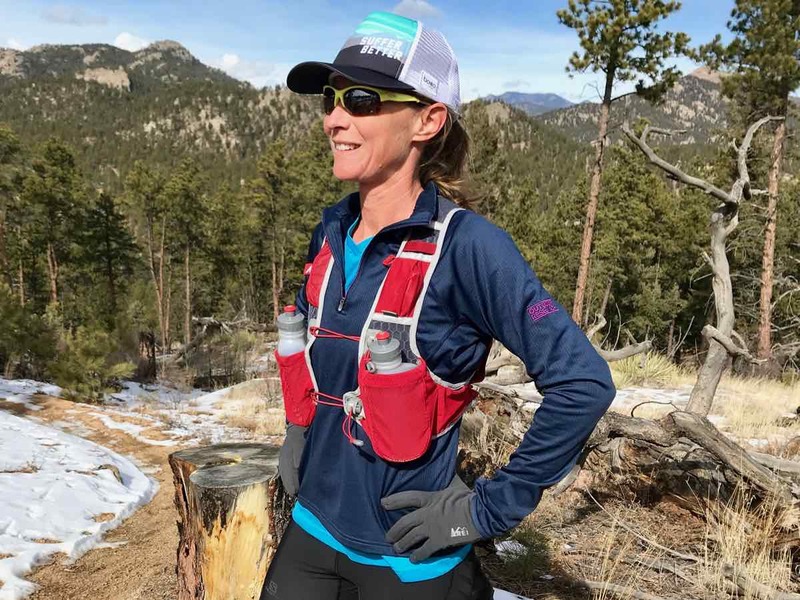 It’s an excellent choice for your trail running gear, snacks, and liquids in about any environment, but I found it to be particularly suited to the warmer-weather outings due to its excellent breathability. It comes in unisex small, medium, and large sizing for chest sizes between 31 and 42 inches. For reference, I wear the small with a 34A bra size and have it cinched 75% to 100% of the way depending on the load. There’s definitely room in this size lineup for an extra small and an extra large given the significant number of trail runners who are smaller and larger than the unisex-sizing range covers. The pack comes in two eye-catching colors, UltraRed and Pitch Black, in each of the sizes. Both have silver and gray reflective hits on both the front and back of the pack for increased visibility at night. One of the standout features of this pack is the proprietary MaxO2 Sternum cords, which uses stretchy shock cords for the dual sternum straps. This eliminates any restriction to my breathing while still allowing for snug cinching. These sternum straps are not vertically adjustable but are well placed for my body. I simply love having the pack accommodate my ‘expando’ rib cage with efforts requiring heavy breathing as I power uphill in our mountains at altitude. The shock cord simply loops around the hook attached at the other side for easy on and off, whether my hands are warm, cold, or gloved. This is a fantastic bit of simple pack technology that really shines. Another brilliant aspect of this pack, especially for those in warm and/or humid climates, is the extremely lightweight and breathable nylon fabric that makes up the bulk of the pack. This large-holed mesh fabric is coated with silicone and polyurethane to further enhance durability and abrasion-resistance. I find that it wicks sweat surprisingly well in temperatures up to 92 degrees Fahrenheit–I didn’t test the pack in any temps hotter than this. On cold Colorado days when I’ve over-layered beneath the pack, the moisture was easily able to move through the pack, eliminating the sticky-back feeling and the chill can that result from this. I found the inner pack material to be slightly rough to my bare skin, mostly because of the hexagon shapes that provide support to the elastic mesh, but with a thin technical shirt, it fits very comfortably and doesn’t cause my shirt to ride up in any direction. All the edges of the pack are covered with a plush micro-fiber polyester, which further enhances comfort and reduces the chance for chafing. Given the number people I’ve seen running in this pack with no shirt on, it must be pretty effective. One key thing I will say about loading this pack is that it definitely rides smoother if it’s well balanced front to back. During my hottest runs in Arizona (80 to 92 degrees Fahrenheit), I found the pack jostled and bounced a bit when I had it front-loaded with water bottles and a phone. The larger bottles contribute to more sloshing and swishing noises as well, which may or may not be an issue for you depending on how easily annoyed you are by such noise on the run. I needed to balance the weight in the pack out with extra unused food bars in the rear pocket to help offset the weight while maintaining full ventilation. In cooler climates, the load comes closer to balancing with the addition of a wind jacket, hat, and a few bars to the back pockets, but perhaps because of the unisex design, the pack never fit as snugly as I was hoping despite cinching well through the front. Careful loading did mitigate most of this issue, but I’d love to see a women’s-specific Alpha 3.0 or at least an extra small in this unisex design. I have a feeling either of these options would allow for a better overall fit on people of my size and smaller. Back view of the UltrAspire Alpha 3.0 Hydration Vest. The reviewer shows how you can access the outer back pocket while the pack is being worn through one of its two low, lateral openings. The Alpha 3.0 comes with two 550-milliliter UltraFlasks made from a firm but pliable, food-grade, low-density polyethylene (LDPE) plastic that can stand up alone for easy filling and cleaning. The bottles have a curved elliptical shape that contours to your chest and ribcage in a surprisingly comfortable manner. It slips easily into the two stretchy bottle pouches on the front of the pack, which can be (must be!) cinched at the top to ensure the bottles stay in as you bound down a technical trail. I love the volume of fluid these two bottles allow you to carry. The easy push-pull nozzle is reminiscent of the bottles of yesteryear, and the high flow that comes forth as you give the bottle a squeeze may catch you by surprise the first few times you drink on the run. I appreciated this aspect, however, because for at least the top half of each bottle, I don’t have to take the bottles from the pouches. The bottles are virtually leak-proof, which gave me the confidence to stash my phone behind one in the extra pocket hidden inside the left pouch against my chest. Incidentally, these bottles are some of the easiest-cleaning bottles in the entire trail gear lineup. The LDPE resists the film that sometimes ends up on the insides of other bottles following the use of electrolyte tablets or other sports drinks that are often on aid-station tables. I’ve used them for both tea and Pepsi products in a race before as well, and after a quick wash with Dawn, the bottles are color- and taste-free and ready for the next run. 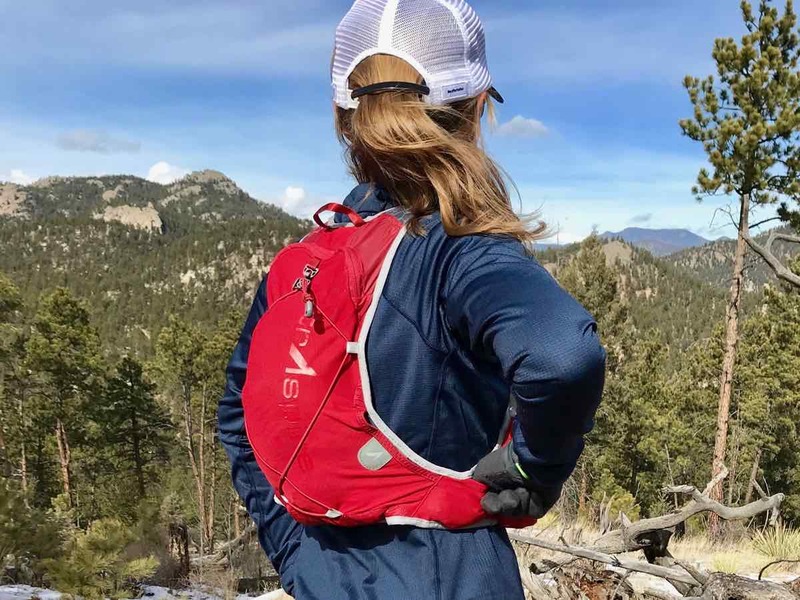 If you choose to purchase and use the two-liter hydration bladder for the rear sleeve, the tube routes over either shoulder easily and holds in place with stretchy guide strips on either side of the front of the pack. The bottle pouches in front then become large pockets for every type of food imaginable. These are capable of holding a small bag of boiled potatoes in addition to larger food bars and gummy blocks with a pair of mittens and a buff for good measure. Above each bottle pocket in the front are two additional smaller pockets. On the right, is the Magnon pocket that opens sideways for easy access to electrolyte pills or whatever other small items (batteries) you might be able to fit into this sweat-proof, magnetic-closure pouch. On the left is a small stretchy zippered pocket that I wish was an inch or two bigger. I could fit a folded-up gel in there and maybe two if my fingers were a bit more dextrous, but overall, it’s a bit too small for my preferences. The pull tab on this zipper as well as the one on the rear of the pack is easy to grab with gloves and is made to not bounce with you as you run on the trail. I love not hearing the “thwap thwap thwap!” of zippers and cords hitting my pack as I run! On each side of the torso is one more stretchy mesh pocket. I like the location, but the opening is small and I have a hard time getting anything in or out. Ideally, this pocket might hold a pack of gummy chomps or a gel or two, but I found I had to stop running and sometimes take the pack off to get anything in or out. This issue might work itself out as the pack breaks in further, but I’d love to see a larger and less stiff opening here. Side view of the Alpha 3.0, with the reviewer accessing one of the stretchy side pockets. On the rear of the pack are two full-length pockets layered on top of one another. 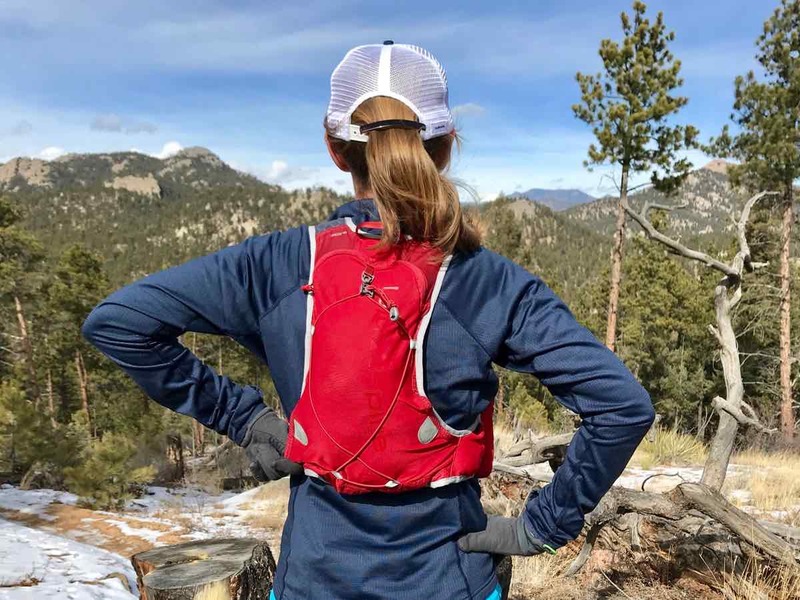 The one closest to your back is for the hydration bladder or is a great pocket for a thin puffy or rain jacket, headlamp (wrapped in your jacket for comfort), or other bulkier items. The outer pocket is continuous with an opening on either side of the bottom of the pack that your hand can reach back into on the run. I found my larger food bars fit well here and were possible to access. Nothing fell out as the center of each access opening is held together midway by a magnet. This pocket was also a good place to run a wind jacket horizontally with more room to stash a hat or gloves for easy access. A bungee completes the rear of the pack for more storage potential for larger clothing options if the other pockets are full. Regarding pockets, for me, this pack relies heavily on my ability to get in and out of the rear pockets because I prefer having the water bottles up front, thus giving me very limited room for food items. I don’t have the most flexible shoulders, so I found myself wishing there was either a larger stretchy pocket on the sides of the torso or layered over the top of the bottle pouches. If you don’t have shoulder issues, a fair amount of food can indeed be accessed via the bottom of the large vertical rear pocket. One last storage detail, I don’t believe this pack has any pole-attachment straps, but perhaps they could be stowed using the bungee on the back of the pack? Overall, I really enjoy using the lightweight UltrAspire Alpha 3.0 Hydration Vest especially for hot runs requiring extra fluid volume. It’s hard to think of a pack with better breathability. With a bit better fit and access to the side pockets or an additional pocket in the front for food storage, it would be amazing. I look forward to seeing how the team at UltrAspire improves upon this in future renditions. Have you run in the UltrAspire Alpha 3.0 Hydration Vest? What do you think of the pack overall for your needs? Storage pockets on the Alpha 3.0, can you share what you put in each of them and how they work for you? How does the unisex sizing work for you? Does the pack fit, ride, and load well for your body type? What do you think of UltrAspire’s unique MaxO2 Sternum cords and UltraFlasks? So, when you say 5.75-liter, do you mean total capacity and not just the liquid capacity? Because two 550ml flasks and a 2L bladder are only about 3.1L. Yes, that’s what the capacity of the whole pack measures according to the Ultraspire website. It did seem very similar to other 5L packs I have, so I think it’s fairly accurate. This is a common way to measure backpacking packs and etc to give you a ball park idea for total capacity for gear. Has anybody had success finding a way to attach z-poles to the front of this vest? Or other solutions? Have a 2.0 that I’m looking to modify. Thanks! I’m curious to know how this differs from the 2.0 version, if you or anyone reading has used both. I have and love the 2.0, but could not tell from your description what makes the difference between the earlier model and this newer model. Anybody know? Thanks! could you answer some questions about the Alpha 3.0? Thank you for another detailed review! – similarly, can ultraspire water bottles or small soft flasks be stored horizontally in the back, and be pulled from the opening? – how much storage room is left in the back with a full 2l reservoir? Do you think there’s enough room for a puffy jacket? My apologies as I’m just seeing this. In case you haven’t found your answers–1. I wouldn’t feel confident in the poles being comfortable storing in this manner, nor would I be confident in their security. I’d be curious if you tried this and can report back. 2. No, the opening, in my opinion, is rather small which would make getting the bottles in/out nearly impossible–perhaps with modification to the opening? 3. Yes, I can fit a thin puffy in the back with the reservoir full and loaded.